Rare combo of Factory Black Ext. Black Leather, Black top. 82K miles. Runs/Drives Excellently. 82,000 Miles. Clean CA title, CA Rust-Free car, OE panels, no accidents. Clean CarFax. -Passed CA Emissions. There were Only 4,877 of the V-12 Convertibles made for 1989. New OE Fabric top in 2011 w/ headliner and new top-boot cover. Leather and wood are 8/10, common driver's seat edge wear, and varnish chipped off center console. No cracks in dash. Carpet 4.5/5. The Rare Chromed Sport Honeycomb alloy wheels are in very good 4.5/5 condition. Full-size spare in trunk. Rare 1989 JAGUAR XJ-S V-12 Convertible -and love it -and get an excellent deal! * Please contact me with any questions or for other photos. get yourself a new Appreciating fun toy! Rare combo of Factory Black Ext. Black Leather, lack top. 82K miles. Runs/Drives Excellently. 82,000 Miles. Clean CA title, A Rust-Free car, E panels, o accidents. Clean CarFax. -Passed CA Emissions 12/15. ++Current Hagerty Valuation of 1989 XJ-S V-12 Conv. is $14,600 --likely at a worse condition. ++New Black Paint Nov. 2015 (score 8/10 or 4/5) -minor blemishes. OE black paint was sanded, rimed & then 3 coats of Acrylic Polyurethane w/ integrated clearcoat... 3 year warranty. ++New OE Fabric top in 2011 w/ headliner and new top-boot cover. +Leather and wood are 8/10, ommon driver's seat edge wear, nd varnish chipped off center console. No cracks in dash. Carpet 4.5/5. The Rare Chromed Sport Honeycomb alloy wheels are in very good 4.5/5 condition. Full-size spare in trunk w/ tool kit. PS, B, Cworks not cold, C (missing parts -available)Pwr. Top, indows, wr. lumbar support, eated seats, og lights.. All work as intended except CruiseControl. +Runs Excellently and very Clean, nstant 1st turn start, mooth idle at 650Rpm, o smoke, o leaks. GM 3-Spd. AT shifts correctly & very smooth. Exhaust had resonators removed =deeper sporty rumble --can be back to OE cheap & easy. ++This has a Lucas Ignition -later in '89 came the Marelli Distributor/Ignition... which had more starting/running issues. +New Front Brakes, rake Lines, lignment & Oil change at 81,000. New Mufflers & Resonators 7/2011 @ 73,000 miles. OE AM/FM Cassette deck -not working well. --I've personally gone through the entire engine bay, ightening the several hose clamps, leaned throttle bodies, hecked fuel lines & belts, hecked/cleaned any corrosion off dozens of wire connections, tc. I like things to be correct and working right. The Conv top hinges have been lubricated regularly and all work smooth & quiet. The car needs almost nothing, nd will bring the next owner years of joy in a beautiful Appreciating Asset. **See OCTANE Magazine Sept.'15 Cover Story on the XJ-S (pic) They Call XJ-Ss "The Next Big Thing" -from Harry's Garage: "Super Refined" -even 10 years before This/my car's production. "Spectacular..-so effortless at speed" "Really Impressive" A Desirable, mooth, owerful, omfortable, uiet, uxury GT." Tom Walkinsaw Racing, aguar's racing team, on the 24 hour Le Mans in '88 & '90 --among other races, ith this same XJ-S Chassis and V-12 engine, hich is legendary for being one of Jaguar's greatest powerplants, roduced for nearly 25 years and often seen with 250,000+ miles. "The Thinking Man's Super-Coupe'". These were Jaguar's top of the line luxury sport coupes competing with:MercedesBenz560SEC-500SL-Porsche928S4 -BMW850i,840Ci-Ferrari400i, ondial, tc. This XJ-S is a pleasure and thrill to drive, hich makes you feel classy, omfortable, tylish, ast & powerful all in one. So solid, uiet & smooth on the highway, t's easy to be at 80mph without knowing it --going from 60-100 to pass is quick & quiet with the smooth thrust of a Jet. It gets tons of looks and thumbs up everywhere from people with great taste aged 15-90+ yrs old. I have been a luxury/exotic/classic auto collector and hobbyist for 25+ years & judge at a few local car shows. --Aware of the Jaguar market, own 2 XJ-Ss -just sold a Great '89 Coupe. ++ Values of these luxury V12 Jaguars have been going up 20%+/yr recently, heir limited production, eautiful design, igh desirability and durability will ensure increasing values over the next 15+ years. I only buy quality, ell-cared-for, ust-free, n-wrecked cars in excellent condition that will go up in value. 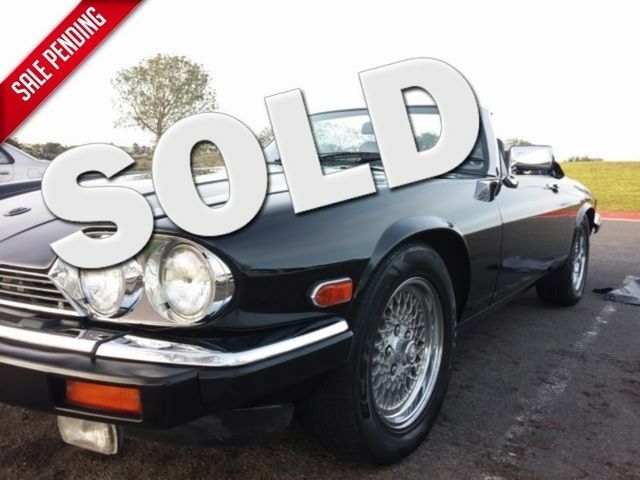 A CA XJ-S CONVERTIBLE in this great condition with Low miles is very hard to find! T=Failed test with Emission Device found to be Tampered. *A "Blank" column can also indicate an aborted test.